Because they make setups more reliable, microfluidic accessories such as tubing, fittings and connectors are of fundamental importance. By enabling microfluidicists to free-up more time to develop and test microfluidic strategies, microfluidic fittings can be an important factor for success. Microfluidicists have common requirements when it comes to their experimental setups. They need to connect the distinct components that make-up a setup, like pressure controllers, liquid tanks and reservoirs, flow switch matrices, etc… Fittings and plugs play an important role in the increased security and reliability of microfluidic setups, allowing scientists to focus on their science and thus speeding up the process leading to new discoveries. This article is part of a series of short introductions to microfluidic accessories. 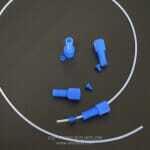 To learn more about the tubing and accessories offered by Elveflow, click here. So let’s start with some basic information about microfluidic fittings and plugs. Fittings are elements that typically consist of a nut and a ferrule, (sometimes the ferrule is integrated into the nut) and have the critical role of providing a secured physical connection of the tubing throughout the various parts of a microfluidic setup. Despite the apparent simplicity of the fittings, some key information must be taken into account in order to choose the right fittings and use them safely. Fittings are generally described using an English mechanical designation of the threads on the nut portion of the fitting (e.g. 10-32, 1/4-28, etc.). In this description, which contains 2 numbers separated by a hyphen, the first number, usually given in gauge or fractions of inches, provides information on the outside diameter of the threaded part, whereas the second number indicates the threads per inch value. In order to fully understand thread fiittng conventions, it is important to know that when a thread goes below 1/4” in diameter, gauge numbers are used when referring to the diameter. For example, consider two of the most widely used microfluidic connectors: a 10-32 fitting indicates a gauge 10 thread diameter with 32 threads per inch, and ¼’’-28 means a ¼’’ inch thread diameter with 28 threads per inch. Of course, when choosing a fitting, it is necessary to ensure that the fitting has the same threading as the receiving port. Although less frequently used, the thread size can also be given using the metric system with 2 numbers separated by an “x” (M3x0.5 M4x0.7 M5x0.8 M6x1.0, etc…). The first number indicates the diameter in millimeters of the threaded part of the nut. The second number provides the distance between threads. It is important to note that whereas English threads are described by the number of threads per inch, metric threads are described by the distance in millimeters between threads. It is also important to note that the pitch in threads per Inch (TPI) plays an important role in the pressure rating of the fitting. Indeed a high TPI value indicates that the fitting in question is able to withstand a high pressure. 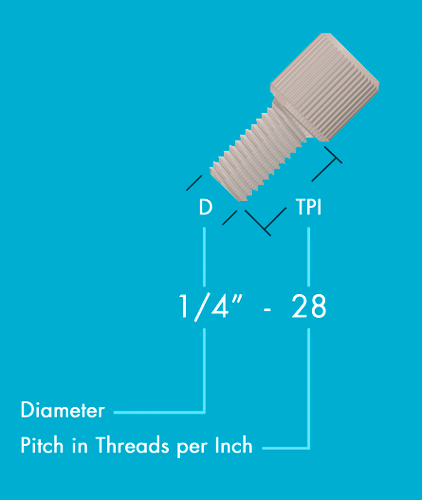 For example, a 10-32 thread provides a significantly higher pressure rating than a ¼’’-28 thread. Plugs are often used to close off unused ports in valves and multi-port connectors. Basically, plugs are just like fittings but without holes and are therefore presented in the same manner. Apart from this mechanical designation, other descriptions, based on the fitting geometry (flangeless VS flanged), can be found. With flangeless fittings, the ferrule basically grips the tubing as the fitting is tightened, both elements working together to make a tight and leak-free connection. With flanged tube ends, fittings are held in place on the tubing by a flange formed around a washer. Fittings can also be differentiated on the basis of the shape of the receiving port (coned or flat-bottom). With coned fittings, the tapered nose of the ferrule is pressed against the base of the receiving port bottom, whereas with flat-bottom fittings, the nose is pressed against the nut while the flat side latches securely in place against the port bottom. 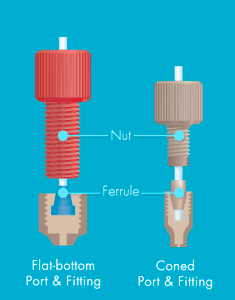 By screwing in the nut, the ferrule adapts itself to the port’s shape and holds the tubing firmly. As a consequence of this progressive deformation, ferrules can only be used a limited number of times. One good thing about this is that replacing an ancient ferrule is quite often a good and simple solution for solving a leakage problem. The tubing size for which the fitting is designed must also be taken into consideration. Indeed when a fitting is designed for use with a particular tubing size such as “1/4″-28 fitting for 1.6mm (1/16”) OD tubing”, the size indicates a maximum OD tube size. But thanks to sleeves, smaller OD tubing can still be used with the fitting in question. In our microfluidic kits section, we offer a kit specifically developed to make life easier for anyone who wants to use 1/32 OD capillary tubing with fittings designed for 1/16’’ OD tubing. The type of material from which fittings and ports are made is particularly important. As a general rule the materials used for the fitting and ports should be of a similar hardness. Otherwise, there is a risk that a hard fitting could damage a softer receiving port or tube, thus leading to leakage issues and rendering these elements unusable in your experiment. Fittings may also be easily differentiated according to way they are tightened: Finger Tight or Wrench Tight. The “Finger Tight” category primarily encompasses Knurled Heads and Winged Heads. 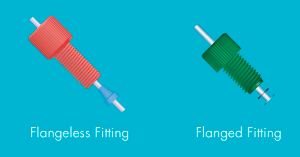 Elveflow offers a series of Knurled Head finger tight fittings, which, as their name suggests do not require specific tools and thus ensure a fast, easy, and leak-free connection to your system. 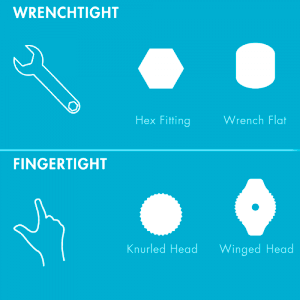 The “Wrench Tight” category is comprised of mainly Hex Heads and Wrench Flat Heads, the use of which requires the appropriate tools. Some microfluidic connectors, often described as “No Twist”, have a special configuration that enables them to hold the fitting in place while still allowing it to rotate about the vertical axis of the fitting. Overtwisted tubes can typically form annoying structures, very much like in telephone cords. These “No Twist” fittings are therefore very convenient because they prevent the tubing from twisting while still being very fast and easy to operate. Do you want to learn more about our products? Browse our catalog of Microfluidics Kits & Accessories and find the solution that suits your specific needs!